I'm finding myself again in the in-between time of the pattern making life. Too busy to work on personal projects. And about 50% of my time has just been administrative work and updates. Add to the mix visiting friends and family and trying to soak in the remainder of the fleeting summer, and you have a whole lot of nothing blog post wise. Summer is busy! Except, I guess I have a lot to blog about, it just doesn't fit into a pretty, neat singular post package. Have you had that feeling before, bloggers out there? So this post is a combo of one of my 'Findings' link roundups as well as a little update on shop happenings. The last few months I have been working on paper versions of Saltbox & Geodesic. This process has had a lot of stops and starts (Saltbox was supposed to be released in July :x ) While paper versions are super exciting, they don't make for an exciting story pre-release. It's just editing and proofing and editing. I am also working on a new pattern! This one is in the very early stages, so that's all I'm going to say. Ok, fine, here's a hint: it has pockets and it's warm. I also have a few more tricks up my sleeve that I have to wait to share. So exciting right? I try my hardest to still do fun, creative stuff for myself outside of Blueprints work and class prep. It's hard to have your hobby also be your job. It's easy to get burnt out. I've been teaching a lot lately, especially some new classes I haven't taught before, and a lot of my time has gone into preparing for these awesome classes. I have a queue of personal sewing things in progress, one of which is my very first full bed quilt. Lately, quilting has been my way to indulge in sewing outside the garment world and it's been working. I feel recharged sewing-wise when I get to work on these projects. I only have two more 12" blocks to go before I can put the whole thing together. Recently, I also helped piece together a quilt with my guild to send to Orlando for #quiltsforpulse. These types of projects, a part of the craftivism spectrum, are very grounding. I also learned a lot piecing a large groups' ever so slightly different sized blocks together. This is an open source computerized jacquard loom. Though just a simple prototype (the loom is still partially manual) the concept is very cool. Jacquard looms are not new, but are typically inaccessible to the home sewer or crafter. I look forward to seeing how this project evolves! This Berlin based art collective Raubdruckerin uses architectural infrastructure in cities to print garments and accessories. Not just as inspiration...they litterally ink up manhole covers and use them to print tshirts. Like the opposite of graffiti. I learned about this group after seeing the #Techstyle exhibition at the Museum of Fine Arts. Threadcult, one of my favorite podcasts, just did an episode with these guys that is super interesting. Also, they're local (based out of Somerville, MA). Their designs, while still a bit expensive to produce and maybe not super comfy are incredibly cool to look at and have fantastic drape. While a tiny part of me cringes at the idea of 3d printing making sewing obsolete, its potential and possibilities are also very exciting! That's all for today! Have you come across any exciting developments in craft, art, technology or the intersections between? In the throws of pattern testing, I haven't had much exciting news to report aside from the fact that the new pattern will be ready this month. But so as to not shirk my blogging responsibilities, here's another edition of Findings! Precious Plastic is an open source program designed to allow anybody to build their own plastic recycling and fabrication studio. I can imagine all sorts of cool objects you could make with this stuff...all their examples are awesome. I'm always thinking about the disposability of things like seam rippers and plastic spools (and, honestly, disposable culture in general) and this project has me dreaming about a line of recycled sewing tools and notions. Now if only somebody could invent a consumer level machine that could quickly process scraps of fabric into raw material to be woven/spun/etc. I recently came across this piece by artist Simon Evans (well, artist duo really, as his wife has been his collaborator for years under his name...a discussion for another time) that got me thinking about inventory. As I work through my wardrobe revamping and thinking about living with less, slow everything, Marie Kondo, etc, the idea of creating an inventory is extremely appealing to me. This Evans piece is more than just a visual inventory of course...if you examine the text below each item you'll find a variety of odd references and social commentaries, which is typical of their work. For the purposes of this blog post, I'm thinking about the work in a visual and loosely conceptual context. It gets me thinking though...how will people in the future remember us and what our lives were like? Will they examine our culture through facebook updates and vine videos? As I mentioned in an earlier blog post, I'm currently reading a book called The Making of Home by Judith Flanders. The book examines how our idea of 'home' in America & Europe was conjured over the course of the last few centuries, through developments in technology, practice, and culture. I'm only half way through it (I'm a slow reader, especially when I'm not taking public transportation: my preferred reading scenario) and in each chapter I've already discovered some wonderful thought seeds about women & work, homesteading, the social power of furniture, etc. I'm a total nerd about the history of domestic experience. Archaeologists and historians often rely on legal documents from the time (such as probate inventories taken at the time of death to value an estate) to figure out what kinds of items people had and draw inferences about how they lived. Part of this is because paintings, though reflective of their times in a variety of ways, are not always direct representations of 'the real life'. Things change a bit when photography is invented. Inventory from 1792, including 1 pair leather shoes, 1 yard black gauze, 1 oz white thread, and a thimble. Anyway, a bit of a rambling of what my brain is doing when it's not thinking about pattern layouts. I like thinking about the future in relationship to history...it gets me thinking. Do you have any creative methods for recycling your sewing leftovers? Have you ever created an inventory of your clothes or anything else? Findings: Cookie tins, earth pigments, and repair guides. 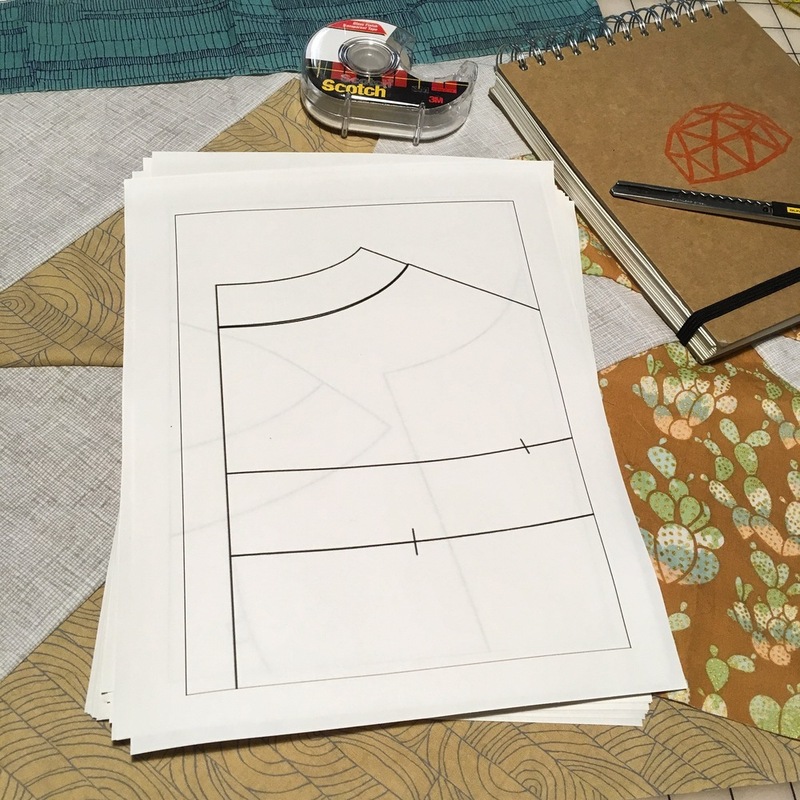 On the Blueprints news front, there isn't too much to write though I do have a few different projects in the works: A zine, a new pattern, and the re-imagining of a pattern I started very early on in the process but took a break after development hit a wall. Doing a little re-development of a pattern concept I've been working with since I started Blueprints. When I make zines, I still really love to use a manual typewriter. I've had this old Royal since college and I find the process of writing on a typewriter so enjoyable. I also have some fun tutorials I want to put together for you, specifically some variations on the A-Frame skirt. But those will have to wait until January as well. But I don't want to leave you blog readers hanging! I am not the most prolific of bloggers, but I try to be consistent when I can. I'm an avid hobby thrifter. Most of the time these days, I don't buy anything. But I love to look. I love the stories I uncover by browsing through discarded and forgotten possessions. Last week, I discovered a cookie tin looking rather inconspicuous in the 'random junk' section of the thrift store (my favorite section, of course). When I see a cookie tin, I know to give it a shake and open if I hear a sound. Until the advent of plastic bags and the ubiquitous-ness of totes, many people kept sewing implements and craft projects in old tins. After eating whatever came in the tins, they became perfect vessels for storage. I'm a bit sad that the days of reusable packaging are mostly gone, though I try to buy stuff that comes in tins (tea, cookies, etc) whenever possible. Upon opening, this tin revealed an unfinished project: A modular calendar. It even included the page from the magazine the kit was ordered from (a 1970's Better Homes & Gardens) that declared "Embroider this Calendar and Use It Forever". This, unfortunately, was not the case. The sad irony and beautiful partial handwork was enough to convince me to take this little surrendered project home. In the past, I've found half finished projects and brought them home with the intention of completing them, but have not always been able to make it happen. I'm hoping the accountability of a blog declaration will keep me focused! (I also have a bag of partially pieced 1930's feedsack quilt blocks I hope to turn into a quilt some day...) There's something very poignant about finishing an unfinished project; The experience is very gratifying. And while we're on the subject of finding old thing, I also picked up this beautiful late 30's/early 40's sewing patterns at a local vintage shop that specializes in nicely curated mid-century furniture and housewares. Tucked into a little box under a table was a lovely array of vintage patterns. While I love the illustrations on all these patterns, I tend to only buy ones that have very unique style lines. These two fit the bill AND are from my favorite era. I can see myself making the dress on the left in some color blocked linen or maybe a chambray with contrast stitching. From the Textile Arts Center: A tutorial on dyeing fabric using soymilk as a mordant! Apparently the protein in the soy acts as a binder for earth pigments. This is a technique I'd love to try in the future. All the fanfare about natural dyes has me thinking about the many possibilities of adding color to fabric using objects from my surroundings. Plants, dirt, mushrooms... If you're interested in other types of earth dyes, these are also quite interesting. Patagonia has always been pretty cool when it comes to sustainability and accountability, but their latest move to publish guides on how to repair their clothing is awesome. Have you ever rescued an unfinished project from a yard sale or thrift store? Did you finish it or re-purpose the materials? It's 2018. And I didn't meet my 2017 goals. And its ok. Picked up this little book when I was up in Maine recently. Excited to read about the history of these cables.